Mrs. Miller's has been making noodles the old fashioned way since we started in 1973. We're committed to bringing you quality products and friendly service. Check out all our product categories below and taste for yourself the Mrs. Miller's difference. Made with extra fancy durum wheat flour and farm fresh eggs, this variety of all natural egg noodles provides a hearty homemade taste. Both delicious and healthy, our Vegetable Noodles are made with extra fancy durum wheat flour, all natural vegetable powders, and egg whites. Cholesterol free. Whole grains provide more fiber, and these all natural, whole grain homemade pastas are made with egg whites only so they are cholesterol free. Made with extra fancy durum wheat flour, but by using only the whites of farm fresh eggs, the cholesterol has been eliminated from these all natural noodles. Experience the goodness of Mrs. Miller's all natural noodles made with the finest certified Organic ingredients. Always have Mrs. Miller's all natural noodles on hand with our convenient bulk sized bags. Our soup base is of the highest quality. On top of the rich flavor; all of our soup bases are gluten free, and contain no added MSG. They are the perfect partner to our homemade noodles. All of Mrs. Miller's homemade pasta sauces contain the freshest ingredients, from vegetables to spices. 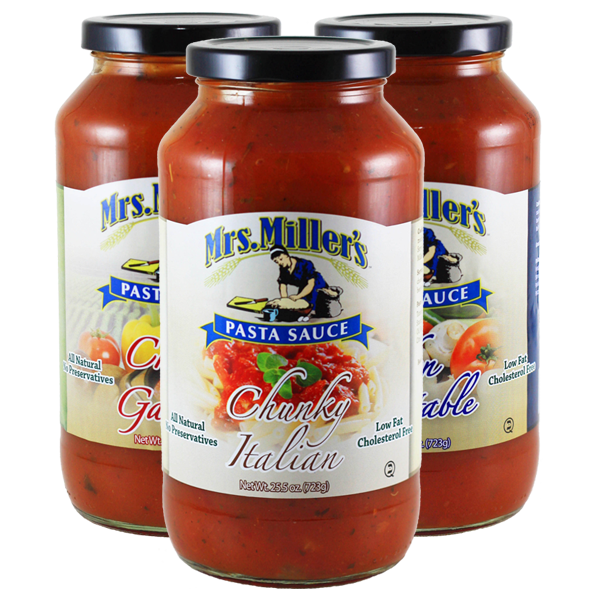 Mrs. Miller knows you will find her old fashioned pasta sauces to be the perfect addition to any casserole or pasta dish. Some of Mrs. Miller's absolute favorites, these homemade goodies can turn a meal or snack into a wonderful experience. Mrs. Miller's Gift Boxes are perfect for any occasion! Buy one for your home or give one to a friend. Perfect for trying new sizes or flavors.